Though I’m not a parent per se, I do have a 1-year-old Bali dog, which is pretty much the same thing as taking care of your child in my naive, inexperienced opinion. And I’m almost positive I can relate to you mamas and papas out there when you say “Happy kids = happy vacation”. That is the main reason I prefer villas to hotels these days – they are much more pet, erhm, kid-friendly! There is staff to look after your little ones, and you can also request for baby cots, pool fences, specialised food menus in the villa. Parents can relax and enjoy their well-deserved vacays without having to stress about whether or not their accommodation is baby proof. 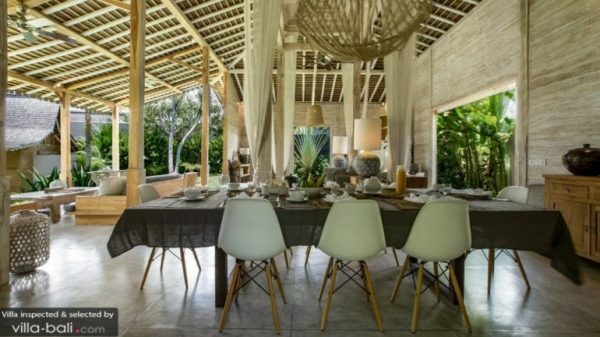 Some Bali villas are even more aptly designed to host families than others, which one of the following will be the best family villas in Bali for you? Hidden away in the rice paddies of dreamy Canggu, the 4-bedroom villa makes the perfect family retreat. The expansive, lush tropical garden features a big green grass lawn where kids can freely run around or kick a ball if not splashing and swimming in the swimming pool. In the afternoon, you can have a family BBQ in the garden or a lovely meal in the open-plan living room. 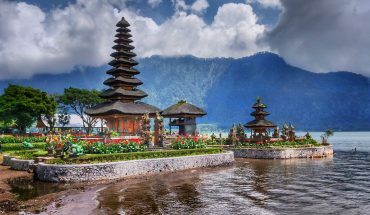 The ambience is peaceful and natural, making you feel miles away from all of the hustle and bustle of South Bali and yet, the hot spots of Canggu and Seminyak are just a short drive away. 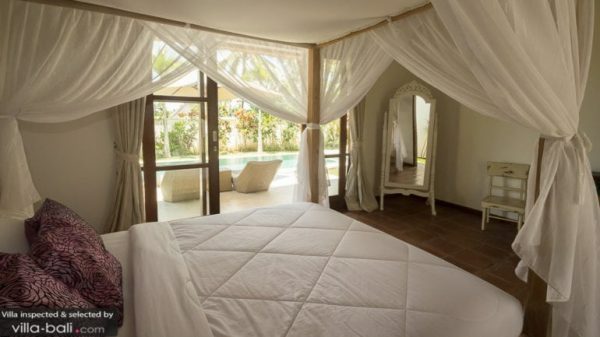 Villa Kami also features a private massage area where you can enjoy in-villa massages. Just perfect! Prices start at US$370 (low season), US$420 (mid-high season) US$470 (high season) and US$600 (peak season). 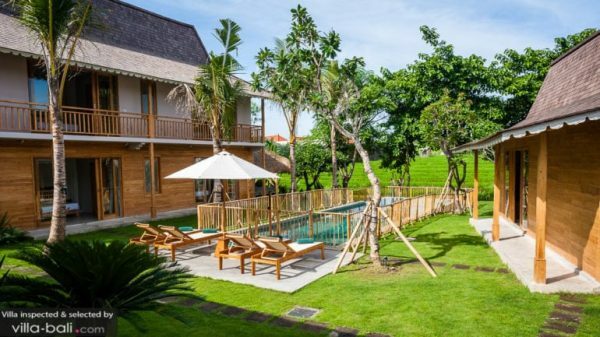 Villa Kedidi could easily be Canggu’s favourite family stay. Parents don’t need to worry about a thing, and kids will absolutely love it here! The service is outstanding, including a private chef. You will also get free membership to the iconic Canggu Club, the place to go to for family fun. If not lounging by the pool or watching the breathtaking sunset at Echo Beach, spend the day at Canggu Club. Slide and splash at the waterpark, go bowling or let the kids jump around at the trampoline centre. In the meantime, you can enjoy a tennis match or a work-out at the gym. Prices start at US$402 (low season), US$460 (mid-high season), US$529 (high season) and US$587 (peak season). Villa Beji has got it all, making your wildest dreams come true! 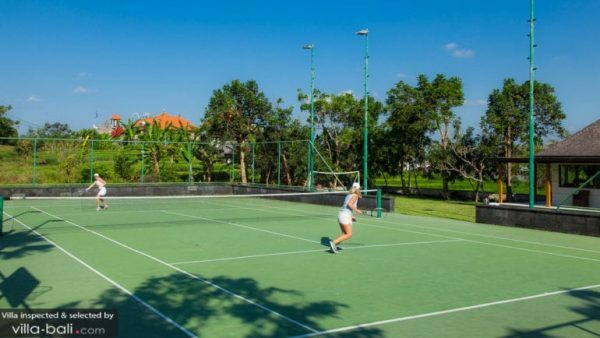 Think a private tennis court, a gym, basketball and a football field, a cinema room, table tennis, a 27-meter lap pool, board games and complimentary access to the Canggu Club, all in one villa?! Not to forget that all of the 6 bedrooms enjoy direct access to the swimming pool, and there is a private chef to cook you yummy treats and meals all day long. You can also request for a personal driver to get you around and the island. Too good to be true? I must admit it seems that way, but all is true! Check it out! Prices start at US$982 (low season), US$1,097 (mid-high season), US$1,270 (high season) and US$1,905 (peak season). 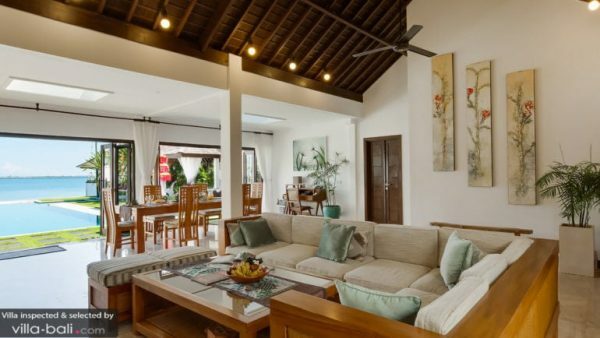 Villa Iluh is a 6-bedroom family paradise located in the heart of Seminyak. The traditional open-plan living space overlooks the manicured lawns of the garden and the massive 18-meter swimming pool. Kids can play in the shallow area of the pool while parents can keep an eye from their sunbed or from the sofa inside the living room. The vast, lofty living space features a single-slab teak dining table and a comfy sofa lounge with a wide HD LED TV for those cosy in-villa movie evenings with the kids. On top of that, two of the bedrooms are wheelchair-friendly. 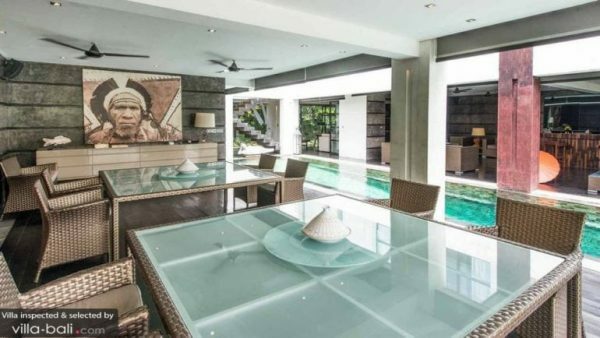 Is this villa really located in the centre of Seminyak? Yes, it is! You can walk to the beach and explore the whole town on foot. Prices start at US$1,000 (low season), US$1,150 (mid-high season) USD$1,560 (high season) and US$1,740 (peak season). Villa M is idyllically located next to a rice field in the center of Seminyak, just behind the famous Eat Street. Shops, restaurants, spas and the beach with happening beach clubs, all is within walking distance of this elegant luxury villa. Villa M is all about location and space. It features a sprawling tropical garden where you can swim, enjoy an in-villa massage and hold wonderful BBQ feasts. Kids can safely splash around in their own shallow wading pool. The villa also features a rooftop terrace, perfect for practising yoga or sip sunset drinks in the afternoon. Prices start at US$440 (low season), US$580 (high season) and US$865 (peak season). 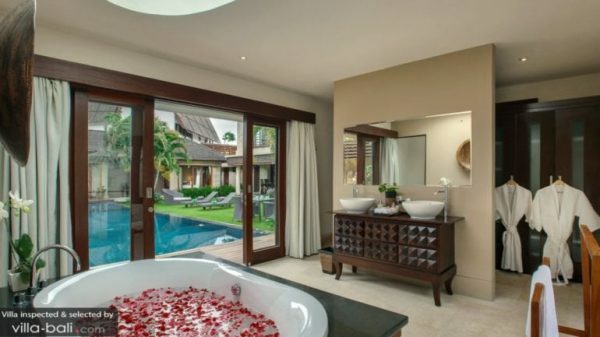 Located in the Oberoi district of Seminyak, the location of Villa Hannah couldn’t be any better. This contemporary luxury retreat features a stunning 20-meter swimming pool that separates the dining room from the living pavilion. Full blown entertainment is provided with a private cinema room onsite. Also, there are lots of toys and books available, making it the perfect family retreat. 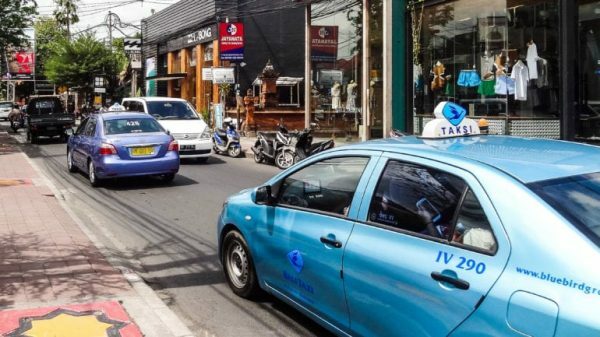 Outside awaits the sandy beach as well as the most happening street of Seminyak. Oberoi Road is home to lots of shopping boutiques and restaurants. Mums, dads, teens and kids, everybody will love it here! Prices start at US$1,200 (low season), US$1,320 (high season) and US$1,440 (peak season). 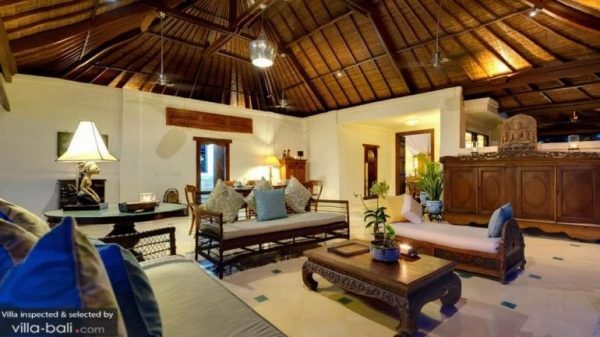 Villa Theo is huge and gorgeous, featuring traditional Javanese Joglo pavilions scattered around in a big private garden. 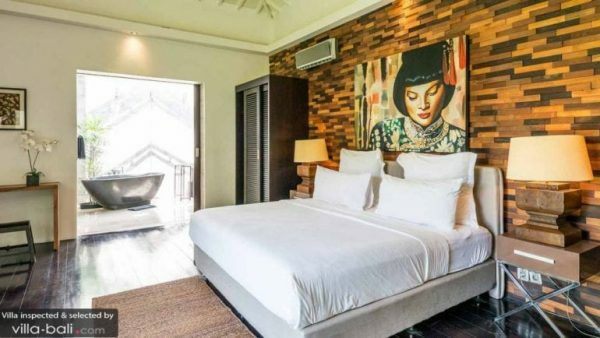 The villa is located in a quiet and peaceful area just minutes away from Seminyak‘s fashionable city centre and a short drive away from Canggu. How ideal is that? Beautiful rustic interior designs are infused with tribal artwork and modern comforts. The estate features a stunning 20-meter swimming pool and a green grass lawn where kids can play. You can enjoy both indoor and alfresco dining in this villa. There is even a private spa and a total of 5 bedrooms tucked in ancient joglo’s with verandas and tropical open-air en-suites. A true tropical paradise with modern luxuries is what Villa Theo is! Read a mom’s review here. Prices start at US$520 (low season), US$700 (mid-high season) US$850 (high season) and US$1150 (peak season). Always wanted to have your own private chef to prepare you a delicious Italian pasta or a haute-cuisine French family dinner? This is your chance! Villa Padawan is located close to the centre of Seminyak, it features a massive garden with a playground for the kids and of course, a private swimming pool. The staff is ready to pamper you 24/7 and yes, there is a private chef specialised in Italian and French cuisine. Kids can safely run around and play with the toys and parents can rest assured as there is a pool fence, baby cot, high chair and even a baby car seat available at no extra charge. 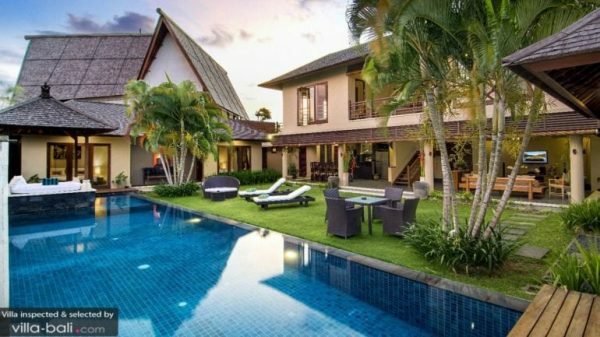 This 4-bedroom villa is just the perfect family getaway, indeed! Prices start at US$495 (low season), US$517 (high season) and US$539 (peak season). This oceanfront family retreat is the kind you only see in movies or on the cover of travel magazines; it is stunning! Stay at Villa Sunset, and the sunset of Bali island will leave you in awe, doing justice to the villas name. 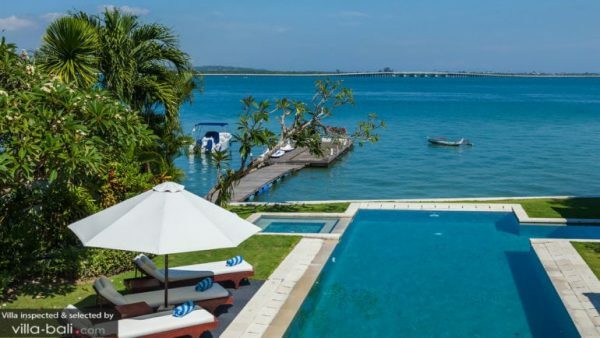 A stunning infinity pool and a jacuzzi, a mini zoo and a private dock from where you can go sea kayaking, Villa Sunset is suitable for the young and old. 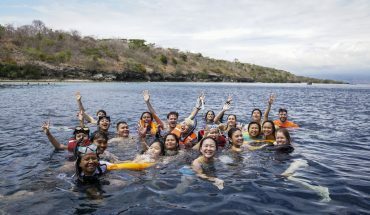 The attentive staff is there to help at any time of the day, and there is even a private car with a driver to take you and your family around the island. Prices start at US$491 (low season), US$571 (mid-high season), US$664 (high season) and US$867 (peak season). 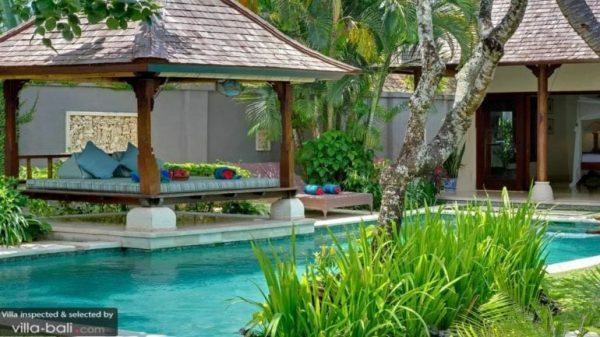 Seeking a peaceful luxury getaway, close but not in the hustle and bustle of Seminyak’s city centre? Villa Alea might be the perfect choice for you! This villa has a huge private garden with rice paddy view and full kid-friendly facilities. There are personal butlers and a private chef available, who can prepare mouthwatering dishes that you and the kids will love. It is also close to theme parks and museums that are perfect for kids. Villa Alea is an affordable choice with outstanding service and facilities. Tropical charm meets modern comforts and family-friendliness. Prices start at US$360 (low season), US$520 (high season) and US$595 (peak season). Which kid does not dream of splashing around in a private swimming pool? To make it even better, this villa has two of them! At Villa Candi Kecil Tujuh, children’s dreams become a reality. This 7-bedroom holiday haven is perfect for large families and friends wanting to spend this Bali holiday together. With two living rooms and two gardens, there are plenty of places to hang out together as well as cosy corners for some quiet time. It is also close to Kemenuh Butterfly Park and the zoo, your kids will have a fun time there! Prices start at US$635 (low season), US$730 (high season) and US$835 (peak season). 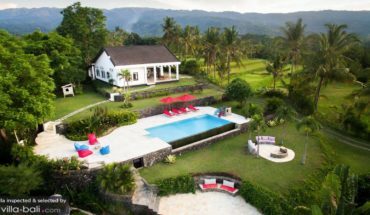 For those families wanting to experience the ‘real Bali’, far away from the crowds and the noise, Villa Tangguntiti is the place to be! 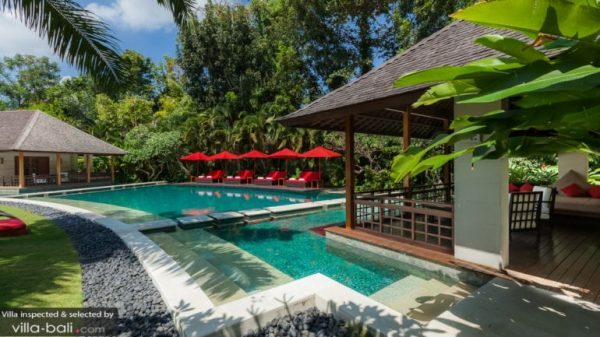 Surrounded by rice paddies and swaying palm trees on the west coast of Bali Island, this 5-bedroom luxury villa enjoys views that take your breath away instantly. Villa Tangguntiti features traditional Javanese Joglo pavilions and a huge private garden that blends in seamlessly with the rice paddy surroundings. From the glistening infinity pool, you can watch the island’s magical sunset. The villa also boasts its very own spa and gym as well as a billiard table. Young and old, everyone will love it here! You can be sure of endless quality time with those you love most! Prices start at US$890 (low season), US$940 (mid-high season), US$990 (high season) and US$1,200 (peak season). Looking for things to do with kids? Get inspired here. 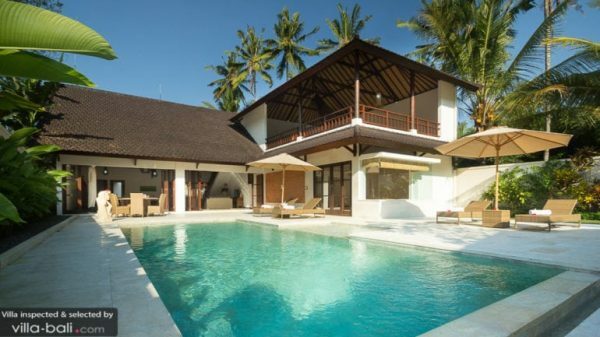 See our family villas in Bali. Inspected and selected by Villa-Finder.com.